This church is built where, tradition says, Saint Mark was driven ashore by a storm on his way back from Aquileia. Here he was told by an angel that the Lagoon was to be his resting place and that 'the city that shall rise on these lagoons will call you its protector'. 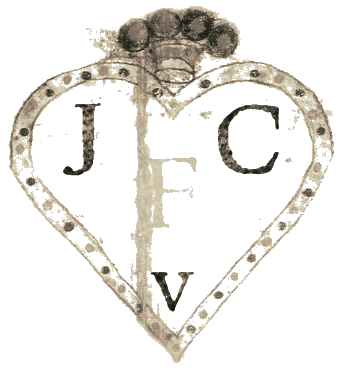 The original medieval church was built by Franciscans in 1253 on the site of a chapel in a vineyard (vigna) which marked the spot. This church can be seen now only on Barbari's map of the city. Some sources claim that this original small chapel survived until demolition in 1810. 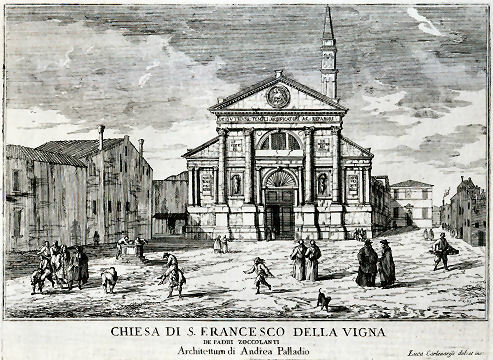 Beginning with his laying of the foundation stone on August 15th 1534, Doge Andrea Gritti sponsored a reconstruction (to designs by the Florentine Jacopo Sansovino) with the intention of revitalising the area. Work was substantially completed by the end of 1554, although consecration wasn't until 1582. Sansovino created arguably the first Venetian Renaissance interior, but failed to complete the façade. 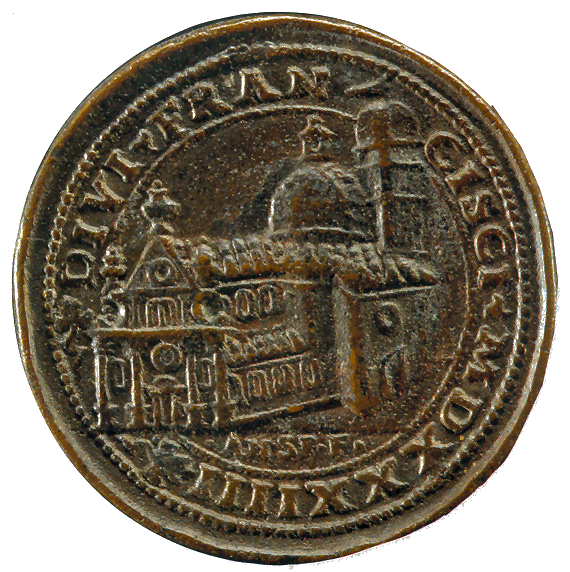 His design is now only preserved on a medal (see right) with Gritti's profile on the obverse, which shows the dome originally planned but never built. When Gritti died in 1538 he was buried near the high altar here. 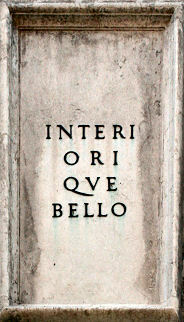 His place as sponsor was taken in the 1560s by Giovanni Grimini who paid for an Istrian stone façade from Andrea Palladio, Sansovino's design now being thought old-fashioned. This was erected in 1568. It was his first-completed ecclesiastical commission and it's a fine and soaring thing (and unusually three-dimensional for him). Palladio had hoped that the building which half obscures his façade would be demolished, but it wasn't, and so said façade can only be appreciated partially or obliquely. In the mid-1990s it was found to be falling away and was reattached and restored by Venice in Peril. The church had suffered bomb damage in 1917. 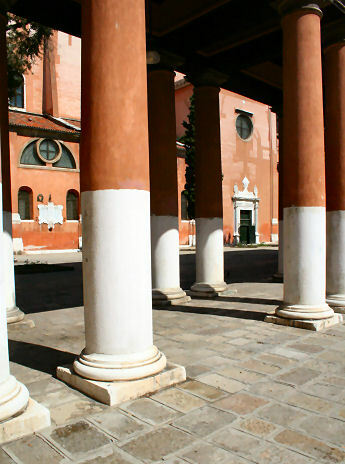 The Palladian-style overhead gallery supported on columns, which is usually one's first view of this church (see photo below) was built in the mid-19th century by Alvise Pigazzi. 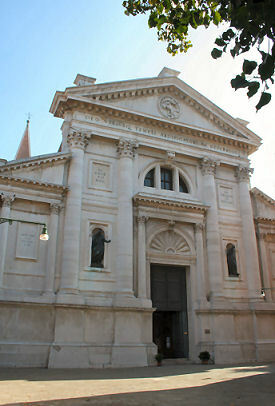 It linked the former Convento delle Pizzochere to the west, which was acquired by the Observant Franciscans in 1838, with the Palazzo Nunciato of 1535, which was given to the Papal Nuncio after the Palazzo di Venezia was received from Pius V, and which had previously been a palace belonging to Doge Andrea Gritti, who is buried in the church. (The palazzo's housing the Papal Legate is commemorated by the nearby Salizzade della Gatte, or alley of the female cats, a clever corruption: la gatte/legate, you see?) Both buildings were taken over by the Italian government in 1866 for use as a military tribunal. 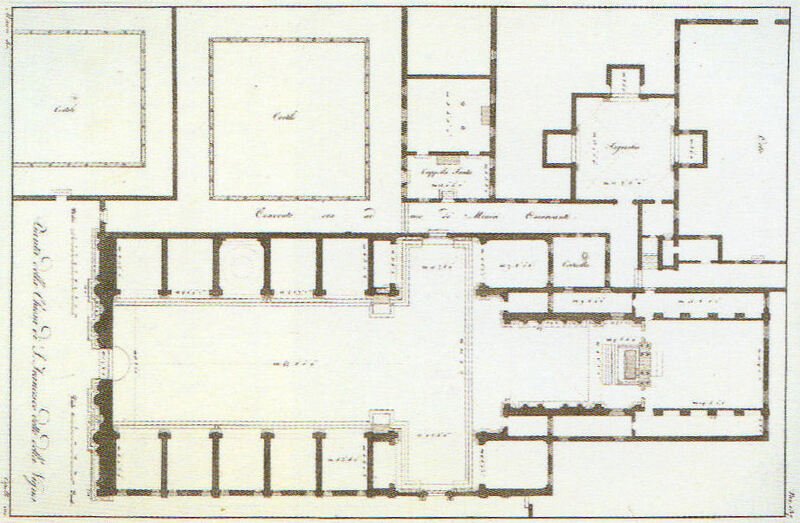 The interior is in the shape of a Latin cross with a single nave and no aisles, but with deep side chapels. The harmonious and plainly pleasing interior is in keeping with the austerity of the Observant Franciscans' beliefs - they came here after a schism with the Frari Franciscans in 1517 - and is said to derive from Prior Francesco Zorzi's study of neo-Platonic proportions, and his consequent adjustment of Sansovino's plans in order to reflect these proportions. They were adjusted to conform with the sacred geometry of the number three, reflecting the Trinity, as set out in the ex-nobleman Friar Zorzi's De harmonia mundi totius of 1535. (This book remained a standard work of renaissance occult philosophy for a century, but has never been translated into a modern language.) The Ark of the Covenant and The Temple of Solomon were made to the same proportions, or so the theory goes, and there's a relationship to musical harmony in there too. But elsewhere you might read that Sansovino himself, influenced by his friend Titian, planned the church to reflect the mystic properties of the number seven. 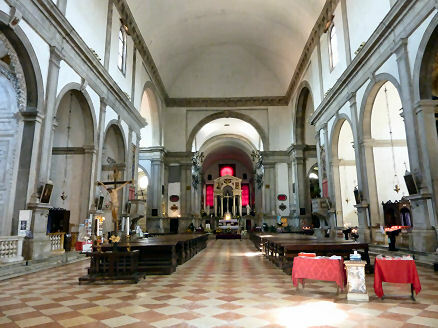 The plain barrel-vaulted ceiling lacks the dome planned by Sansovino but never built, and putting the monk's choir behind the altar was an innovation of his later adopted by Palladio. There are five chapels on each side of the nave, some more decorated than others, but most very plain and Franciscan, the better to show off the colours of their altarpieces. 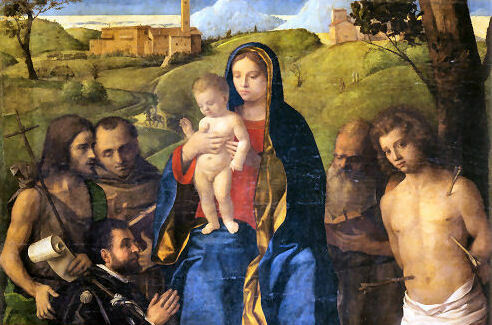 The first on the left is very finely frescoed by Battista Franco (called Il Semolei) with an Adoration of the Magi over the altar by Federico Zuccari. The third on the left is a shiny white marble box with much carving, and some trompe l'oeil painting in the corners by Tiepolo. The ceiling, which looks like the work of Tiepolo too, is actually by Girolamo Pellegrini. The sacristy (through a door in the left transept that also takes you to the Capella Santa) contains a Sansovino altar and some not-great paintings. 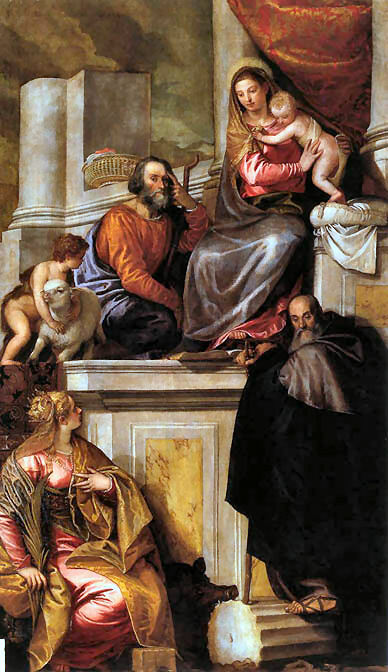 The Giustinian chapel, fifth on the left, contains Veronese's Virgin and Child Enthroned with Young John the Baptist and Saints Catherine and Anthony Abbot (see below right) an altarpiece that is well worth some money in the light, and a linger. It was his first major piece of work in Venice, painted around 1551, four years before he settled here. Its pyramidal and asymmetrical structure shows the influence of Titian's Pesaro Altarpiece in the Frari. Another Giustinian chapel (the big one to the left of the chancel) has a bas-relief of The Life of Christ by Pietro Lombardo, with reliefs of the four evangelists by his son Tullio. Another painting by Paolo Veronese, a Resurrection of Christ in the forth chapel along on the right-hand side, the Badoer, is less lovable, less well-preserved and described as an attrib. although it is mentioned by both Ridolfi and Borghini. The Capella Santa (named after a miraculous Madonna) contains a Virgin and Child with Saints and Donor (see right) a late Giovanni Bellini which is rather fine despite being obviously ‘and studio’, especially the faces of some of the saints, although the portrait of the donor (Giacomo Dolfin) was changed later. Vasari says that Bellini originally provided the church with 'a beautiful picture of the dead Christ' which was so admired by King Louis XI of France that it had to be presented to him as a gift, and that the replacement was less good and reputed to be mostly the work of a pupil of Bellini called Girolamo Mocetti. There's also an odd Madonna and Child Enthroned by Fra Antonio da Negroponte in the right transept. It's his only work, and although it was painted in the mid-15th century it's eccentrically gothic and tapestry-like, with a sumptuously-painted gown on the Virgin, painted paper inserts and some quirky figures and classical architecture. As recently as the early 20th century it was thought to be by Vivarini. The lunette, added later and depicting the Padre Eterno, is by Benedetto Diana (or Francesco Bissolo, a follower of Giovanni Bellini). The Save Venice web pages for this church have good reproductions of these paintings. 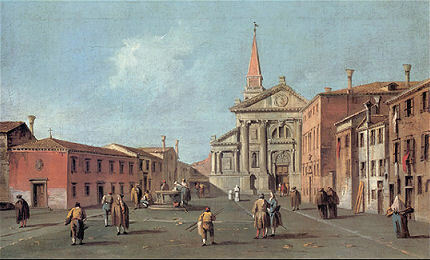 View of the Campo and the Church of San Francesco della Vigna by Francesco Guardi (below right). And (further below right) an engraving of the church by Carlevarijs. 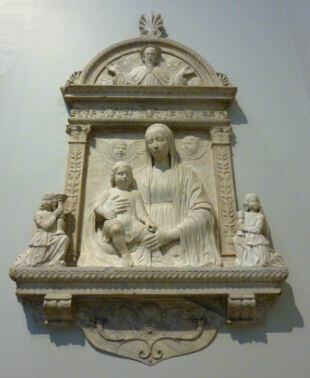 A relief of The Virgin and Child with God the Father (see far right) by Giovanni Buora, partner to Pietro Lombardo, is now in the Victoria & Albert museum in London. It was probably once in one of the Giustinian chapels. Jacopo Tintoretto's c.1552 Christ Carried to the Tomb, commissioned by the brothers Zuanne and Zuan'Alberto da Basso for their family chapel, third on the left (now the Sagredo Chapel), is now in National Gallery of Scotland in Edinburgh. The disembodied pair of feet top right are all that's left after the canvas was cut from its frame whilst being stolen in 1648, leaving its arched top and an angel holding a crown of thorns behind. A third work by Paolo Veronese is mentioned by Ridolfi, a Virgin and Saints fresco commissioned by the Cuccina family in 1562 for their altar in the sacristy here, and even repainted after it was damaged in the Arsenale fire of 1574, but itself destroyed. A fresco depicting The Conversion of Mary Magdalene by Federico Zuccaro, formerly in the Grimani chapel here, is now lost. A copy by Pedro Campaña is in the National Gallery in London. The convent with the row of columns in front (see above) stands in for the Questura headquarters in the German TV adaptations of Donna Leon's Brunetti novels. Base Renaissance, but must be visited in order to see the John Bellini. In a city not chock-full of such spaces this church has a connected pair of lovely, visitable and very photographable cloisters which are amongst the oldest in Venice. A third, larger, one with only two logias is less frequently open to visitors. The 12th century campanile was repeatedly damaged by lightning and then demolished in 1489. The current tower is one of Venice's tallest, along with the Frari's and after San Marco's, upon which it was modelled. It was designed by Bernardo Ongarin and built between 1571 and 1581. Ongarin is buried at its base, as commemorated by a plaque.